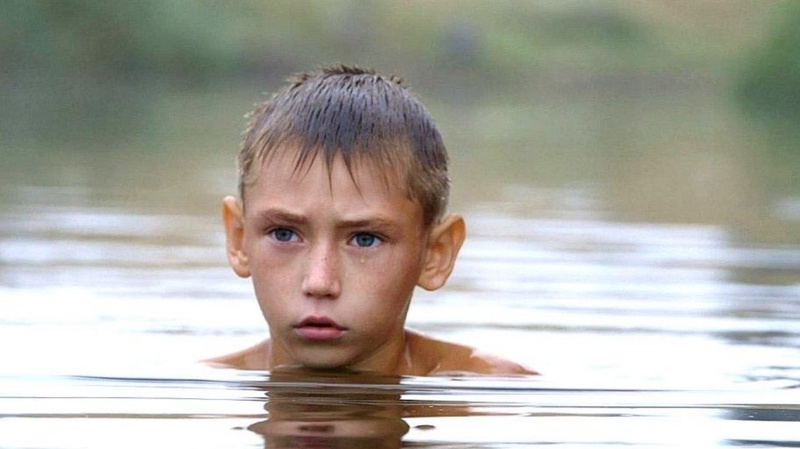 I discovered Simon Lereng Wilmont’s The Distant Barking of Dogs, a poetic look at everyday life on the frontline of the War in Donbass — as seen through the eyes of a 10-year-old Ukrainian boy who lives with his grandmother in the warzone — at IDFA last November. After nabbing the First Appearance Award at that prestigious festival, it went on to win the Student Jury Award (from an all-kids jury) at the Docudays UA fest, where I watched as the Danish director appeared onstage only to quickly step aside so that the young protagonist and his entire family, having traveled all the way from Donetsk to Kiev, could accept the award instead. Serendipitously, I ended up meeting and chatting with the humble inquisitive filmmaker between post-fest flights back to Schengen territory. And now thanks to the Human Rights Watch Film Festival, where the doc will be having its NYC premiere today, I’ve found the perfect excuse to continue that intriguing conversation. Filmmaker spoke with Lereng Wilmont prior to the June 18th (Film Society of Lincoln Center) and June 19th (IFC Center) screenings. Filmmaker: How did you discover this story? What made you want to make a film about Oleg and his family in the first place? Lereng Wilmont: I made two short documentaries just before The Distant Barking of Dogs, and they both featured children who lived very normal and stable lives. The films each followed a child’s individual struggles to restore stability in a world temporarily thrown off balance. Having done these shorts, I couldn’t stop thinking about the converse of that premise: how children in very unstable and dangerous parts of the world struggle to find some sense of fleeting stability and comfort. That’s what ultimately led me to Eastern Ukraine and Oleg. Going there, I initially planned to make a film about what growing up in the shadow of war does to a child. That is, how a child is affected by living in a place where the war is being fought out just beyond the hills in the horizon. This is a sad reality for many children in the world’s conflict zones, and I wanted to give the kids caught in this particular conflict a voice too. As it happened, the war swept up close and over us during the filming, so the film grew to also become a film about what growing up in the midst of war does to a child — and how crucial family and close personal relationships are if you are to survive with as few inner and outer scars as possible. As I travelled down the southern part of the frontline with my fixer, I asked all the kids I cast to tell me what it felt like when they were afraid, and none could really answer that question. That is, until I met Oleg. He hesitated for maybe a heartbeat, reflecting, and then looked straight at me with those ice-blue eyes and said, “It’s like there is this cold hand reaching into my chest, grabbing my heart, and when the first shells start to explode, the hand starts squeezing it, little by little, until my heart is a little, cold lump. That’s how I feel when I am afraid.” And that was it for me. I knew I had to make a film about this child and his grandmother Alexandra. Filmmaker: I don’t think you have any background working in conflict zones, though. How did you prepare to shoot on the frontline of a war? What were the challenges? Lereng Wilmont: No, I didn’t have any previous experience working in a conflict zone. But the project was also very low budget in the beginning, so all I had was one day with a former special-forces marine, who taught me the basics. For example, how to make a tourniquet, and what to scout for when I went to new places, and good advice like that. But apart from that, everything was pretty much learning by doing. Luckily, I had a fantastic fixer who taught me the rest of what I needed to know with the specific circumstances of the conflict zone in Ukraine. As for challenges, I would have to say that the biggest was the initial constant concern that I would miss crucial events in Oleg’s life. His whole world is so strongly tied to the conflict, and I could not be there all the time. With the conflict being so unpredictable and changing all the time, I quickly learned the hard way that I just had to try to keep up and cover the most important events as best as I could when I was there. A little later in the process those concerns naturally grew and developed into a more specific worry about Oleg and Alexandra’s actual safety and wellbeing. To this day I still check the military briefings at least once a day to see how the situation is in Hnutove, as I did when we were shooting. And I know I will do that for as long as the conflict is raging. Another challenge was to keep taking the danger seriously and not become lulled into a false sense of security by the days of silence, or become a little too casual towards the sounds of war because you think you know the lay of the land. I remember a night near the end of the filming. We had all eaten a beautiful dinner outside of Oleg and Alexandra’s house in the garden. The food was wonderful, the night was warm, and we had been telling jokes and laughing a lot. It had become late, and I was tired, so I wondered where our driver was because he should have been there at this time to pick us up. When I asked my fixer, he explained that the driver had called, and that he was detained at the checkpoint due to heavy shelling in the area. I realized that both sides had been shelling each other for most of the evening and that we had simply stopped noticing or reacting to it. That scared me. Filmmaker: So as a Dane filming in Donetsk did you feel accepted — or viewed as an intruder from the West? Lereng Wilmont: I did encounter a bit of initial mistrust and suspicion in the early stages of the project. But I think it’s only natural when you’re working in areas like this, where tomorrow is so uncertain, and all kinds of strangers suddenly come barging in and take a keen interest in your daily life and reality. But I find that if you spend enough time and effort in the same area, suspicion is soon replaced by curiosity. So we made it a rule to small talk a bit every time we would meet someone. If you do that, you will find yourself breaking bread with them sooner rather than later, and that’s where the ice really breaks and you can get to know each other. Overall, it wasn’t long before I felt really welcomed. Filmmaker: There’s that warning to directors to avoid working with animals or kids — but you seem to have a history of telling nonfiction stories from the viewpoint of children. Why are you so drawn to the kids’ POV? Lereng Wilmont: It’s true that over the last few years I have made films that follow pre-adolescents or teenagers. I think I have been drawn towards this POV because this time is where most of our lives are first touched by the serious realities of adulthood, with all its requirements, challenges and demands. Childhood naivety is exchanged for experience, and we discover new truths and possibilities that broaden our horizons. The relationships that we foster during this particular period, as well as the experiences and resultant transformations, send ripples throughout our lives. It’s a stage in life that I feel shapes us in many ways into the people that we will become later. So it’s a very dramatic time, and its stories are often universal and should therefore be shared as widely as possible. Such stories can inspire, help and empower people in their lives, even though we might be worlds apart. That said, I like to think that I am diverse and that my work continually evolves. So I am not sure that the next film will be from the POV of a child, or even about this age group. I just go where fascination and the next story take me. Filmmaker: Back at Docudays UA in Kiev, where I first met you, the film fittingly took the Student Jury Award, and you stepped aside to let the family come onstage to accept it. It was a truly touching moment, but it also made me wonder how the film has affected Oleg’s life. He’s quite shy, and he seemed a bit surprised, like a deer caught in the headlights. Do you worry about how your camera impacts the lives of your young subjects? Lereng Wilmont: Yes, I have worried about how the film impacts both Oleg’s and Alexandra’s lives ever since I knew it was going to be a film — a lot actually. So we have tried to shelter the family as well as we could. They were the first to see the film, and we have had a lot of talk with them, both before the premiere and continuously after, about how to handle the spotlight and what comes with it, good and bad. We have also arranged it so that there are a small handful of trusted people — us included — that Oleg and Alexandra can always reach out to at a moment’s notice if there is something that worries them or that they are concerned about. Oleg did actually begin to cry at Docudays when I called him to the stage to accept the award along with me and the rest of the family. That really took me completely by surprise, because he had been thoroughly enjoying the previous days of media attention, interviews with the press, and Q&As after the screenings. He was so proud and happy in that spotlight, and we had talked a lot about it in the evenings, so it was a little difficult for me to understand his immediate reaction to the award. As it turned out, it was because he hadn’t realized there were several awards at the ceremony. Since ours was not the first to be given out, and he was so unhappy that we hadn’t won, he didn’t really realize we got the award when we finally did. He thought it was some kind of comfort prize. So I sat down with him and explained what had actually just happened — and naturally, that he should have the trophy. That helped to cheer him up. It now sits in a place of honor in his room.